With school about to get underway for the new year, that means fall sports aren’t far behind. Do you have the gear your child needs to stay safe and protected in his or her sport? While your child’s school or community team will likely provide some or all equipment, it’s important that you as a parent have a solid understanding of what protective gear is needed — and what condition it should be in. Let’s take a look at the gear needed for common fall sports. We’ll start with the most prominent fall sport. Before your child hits the field, make sure he’s geared up appropriately. Your child shouldn’t just wear any old helmet. In order to protect your football player, a helmet must properly fit him. When a helmet fits properly, the front of the helmet should sit one inch above the eyebrows. The chin strap should be centered and snug, and jaw pads should feel firm against the face. It’s also important to ensure that the helmet is in good condition. While soccer doesn’t require a lot of gear, there are some essentials. Before your child or teen takes to the soccer field, make sure he or she is wearing the basics. 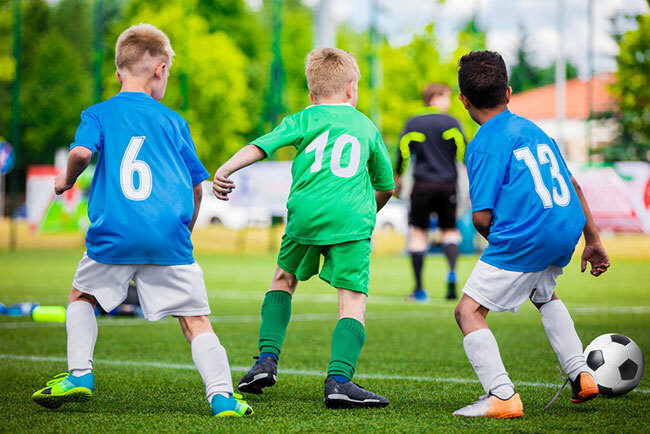 Protective soccer gear should include appropriately fitting cleats that are tightly laced, shin guards that are snug and end just below the knee, and a mouth guard. Because soccer players don’t wear helmets, a properly fitting mouth guard is an effective way to protect the teeth and inside of the mouth. Soccer goalkeepers have additional equipment needs — and will want to wear protective padding and specialized gloves to protect the hands. Like soccer, volleyball also doesn’t require a ton of gear. But there are essentials that will help protect your child on the volleyball court. It’s important for a volleyball player to wear pads that protect the elbows and knees in case of falls, as well as palm protectors that protect the palm of the hand. Palm protectors have a dual purpose, in that they protect the hands and wrists from both the volleyball itself and falls. Specialized shoes designed for volleyball are also essential. These shoes provide a better grip on the volleyball court, which can help prevent sprains, strains and falls. When it comes to sports played on the diamond, head injuries are unfortunately common. For these sports, helmets are particularly important. Before taking the diamond, your child should have a properly fitting helmet that meets NOCSAE guidelines. The helmet should be worn anytime your child is at the plate and should cover the back, top and sides of the head. It should fit securely and not move when the head turns from side to side. Other important safety gear for softball and baseball includes protective padding for catchers, an athletic supporter with or without a protective cup, and appropriately fitting cleats. If your child wears contacts or glasses, protective eyewear may also be necessary. One essential before the sports season begins? A sports physical. Need a doctor? Find one here. I think Children’s Hospital should let the public know about the awesome pediatric Orthopedic doctors we have!